Can I just say a big thank you for the curtain pole. It came exactly when you said it would, the craftsman ship is first class and already friends are asking me where I got it. Could be some recommends coming. Today I took delivery of a made to measure curtain pole and a pair of tiebacks supplied by yourselves. I just wanted to let you know how delighted I am with these. The craftsmanship is first class and the pole fits my bay window perfectly. I was amazed to discover that I cannot find even a minor blemish with the pole that you have made for me. It looks fantastic and I am really pleased with it. Can I also let you know how good I consider your customer service to be. The lady I spoke with was polite, very pleasant and efficient. I was really appreciative that she made the effort to get the pole delivered to me on a day that I was available to take delivery anda little more hthat you stuck to this stated delivery with no fuss or bother. I have had some bad experiences with companies before in this respect and so it is a refreshing change to deal with a company like yourselves. I've received my recent order from yourselves. My husband and I are very impressed, not only with the speed with which the items were delivered and the quality of the curtain poles but also with the thoughtfulness of providing fittings in the purchase price. We wer able to mount both poles the day they arrived and they look great. We will certainly recommend your organisation to our friends. I have just taken delivery of my curtain poles from you... and I just wanted to say thank you. They are fantastic, exactly what I wanted and the perfect finish with bronze patina. Your service was great, from the enquiry emails, the telephone calls and the speed with which they came thru! "I just wanted to say thank you for the excellent service and curtain poles you provided. Having never ordered custom made curtain poles I was apprehensive, but the poles you supplied fitted my "rounded bay" windows perfectly. With the curtains now installed they look excellent, so as a message to anyone who is considering purchasing custom made poles from Celtic Dreams Ironwork, don't hesitate- they provide excellent service, value for money, and products. " 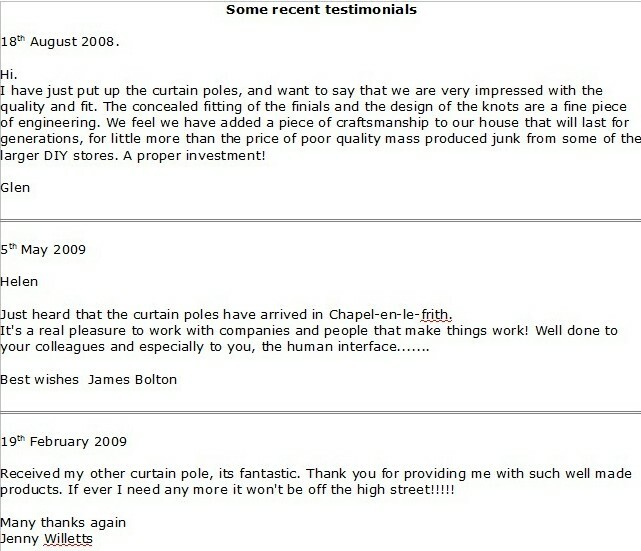 "Dear everyone involved in making our strange shaped bay window curtain pole and smaller window pole. We were impressed by the quality of work and they look fantastic. Thank you- keep up the good work! We will certainly order from you again in the future as our house restoration progresses. They were packed really well too. No damage after coming all the way from Wales. Thanks again Karen and Trevor Hatt "
"Thank you so very much for getting my two hookbacks to me today. Very much appreciated. I would just like to say how totally impressed I am, as are the two clients who now have your bay poles, with the beautiful quality of workmanship that your products show. It really is refreshing to find made-to-order items that have obviously been made with the highest standards in mind, and by people who care. Well done and thank you to all concerned, and I look forward to using you again. Best regards Lucy Byrom "
" I am just writing to thank you for the bay window curtain pole you made for me (Cage & Ball, in antique silver/black). I've fitted it up in my home, the fit is perfect and the finish is brilliant, it is certainly a major talking point. The holdbacks in the same style set the curatins off a treat- what more can I say! The curtain pole is an exact fit to the bay and it was a simple task to fit and install especially as all the fictures and fittings are included in the price, also the speed of delivery was faster than I expected. I will cetainly be recommending you to my family/friends in the future, again thank you very much. I just wanted to write and say thank you for the beautiful bay window curtain pole we received from you last week. It is absolutely perfect in every respect- from the design to the colour to the ease of fitting it. In all aspects of dealing with your company we are 110% happy and will return to you with our business, as well as recommend you to others. This has been a perfect shopping experience and we thank you for that ! I just wanted to say thank you for your excellent service and excellent products. The curtain poles are lovely and I was happy with the fixtures and fittings being included. I will definitely order from you in future.
" My two portiere poles have arrived- beautiful workmanship( as ever) and exactly what my client wanted. Well done you and thank you so much. Having taken delivery on time of my client's bay window pole and two straight poles, we did indeed fit the poles and hang the curtains last week. As you know the fitter was concerned about the bay window and I have to tell you he was eating his hat. The pole fitted like a glove: it is perfect in every way. My client is absolutely thrilled with the job and has described the work as "stunning"
I think you deserve credit not only for making a fantastic product but also for delivering on time, always helpful and polite when I had a query and making what can be a problem fitting a pleasant and easy task. I have already recommended you to another client and I know the franchise company Fit-Ex will be contacting you in the future about making their bay window poles. We'd like to thank Celtic Dreams for our fantastic curtain poles. We're impressed with the service, but most of all the quality of the workmanship. If we could fault them at all, it would be to say that they now steal all the limelight from the curtains themselves! If you'd like us to write a review for the website, or if you'd simply like to quote the comments above, that would be fine with us. Needless to say, we are recommending CD to family and friends! Just sent an order for extra holdbacks but not sure it's clear what type I want. It's ball holdbacks. Would also like to say I am thrilled with the order I received recently. Exactly how imagined,I thought initially was a lot to spend, however I know I have a quality item that is going to last. I will definitely be ordering more! Our order of 4 curtain poles c/w finials has been a resounding success and having fixed them on the wall this weekend, they exceeded our expectations. They arrived promptly, are manufactured to an exceptionally high standard and represent excellent value for money. Thank you from one very happy customer. Curtain poles arrived today and I am really pleased with them. Took a risk with the order as just went for your website. So many thanks they are now up in my cottage and I will recommend you to others. My order arrived yesterday tie backs too. Very impressed and glad i found your company. Large pole is now up and looking so good. The antique copper is a very close match to our fireplace tiles. Refund receipt arrived today .Thank you very much. Excellent service, I'll most certainly recommend your company and will order any more poles I need. Just wanted to let you know that the curtain pole we ordered from you arrived safely and I put it up last weekend. It is a perfect fit and looks great! I'd have sent a photo to prove it but unfortunately our camera has decided to stop working. Thank you so much for all your help and advice when I was placing the order and sorting out the issue with the delivery. As you know from our conversations my wife and I spent a lot of time trying to find a decent pole for our awkward bay window without success.All of the poles we found elsewhere were made of pretty flimsy hollow metal which would of required numerous brackets to prevent bending with heavy curtains. They also obviously had to be cut to size and joined in the middle with a central bracket. Only a few were able to be ceiling mounted and those that did required conversion kits which weren't really fit for the job and would have left us with curtains hanging below the top of the window. The cost of these poles was on a par with the one ordered from Celtic Dreams but now we have got a one piece solid iron pole made to measure which looks great and because it only requires three brackets was far easier to install than any of the other poles we looked at. Pole arrived on time yesterday. Thank you very much. Have not put it up yet but it looks as good as ever with your craftsman & the deeper brackets which you have made should do the trick too. I don't order many poles my self but I have always come back to you over the last 12 years & given your name to friends, family &� customers. Only difference this time is seeing your products on internet & have expanded your range, well done to you. ..just wanted to say that we are so pleased with every aspect of this company. 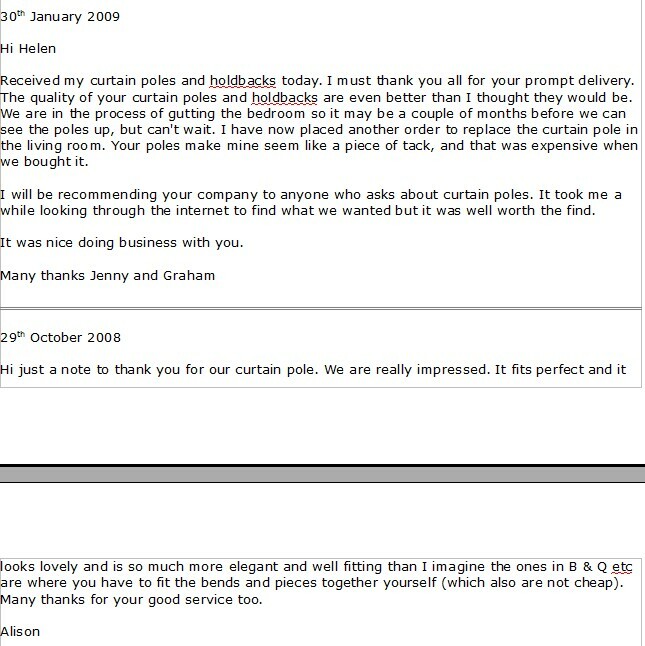 The customer service from Helen was lovely, the delivery time was as stated (even just before Christmas) and the pole was just as asked for. It was a tricky order and it is perfect. I particularly like the fact that the finial is forged as a continuation of the pole, and looks great, unlike other companies who faff around with grub screws etc! I will be ordering loads more poles for the rest of the house in the New Year and will be recommending the company to all those who ask.